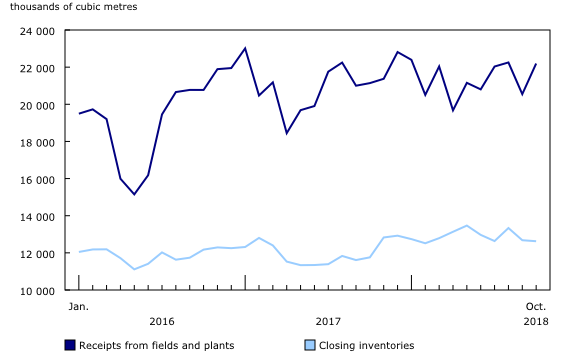 Pipelines received 22.2 million cubic metres of crude oil and equivalent products from fields and plants in October, up 5.0% compared with the same month in 2017. The vast majority originated in Alberta (87.5%), followed by Saskatchewan (9.7%). In October, closing inventories of crude oil totalled 12.6 million cubic metres, up 7.4% year over year. In the first 10 months of 2018, closing inventories averaged 9.2% year-over-year growth compared with 0.1% over the same period in 2017. Pipelines delivered 7.7 million cubic metres of crude oil to Canadian refineries in October, up 7.2% from the same month a year earlier. Of the total volume, 62.8% was sent to Western Canadian refineries, while the balance was delivered to refineries in Ontario and Quebec. In October, pipelines exported 15.0 million cubic metres of crude oil and equivalent products to the United States, up 3.0% year over year. Meanwhile, imports totalled 1.4 million cubic metres, marking the lowest level since the start of the data series in January 2016. Pipelines received 2.9 million cubic metres of propane, butane, and other products from Canadian fields and plants in October. Meanwhile, closing inventories of the same products totalled 1.8 million cubic metres. In early 2019, this Daily article will be part of a new consolidated monthly energy release where data from multiple monthly energy surveys will be released on the same day. Data in this release are not seasonally adjusted. For more information, consult the methodology document "Monthly Oil and Other Liquid Petroleum Products Pipeline Survey." Crude oil and equivalent products include the following liquid hydrocarbons: crude oil, condensate, pentanes plus, and synthetic crude oil. Inventories include inventories held in pipelines, tanks and terminals, but exclude inventories held in field batteries and inventories held in the United States. Receipts from fields and plants include receipts from batteries and terminals associated with field separators and field upgraders, and receipts from gas processing plants and extraction plants. Receipts from fractionation plants are excluded. Imports include receipts of foreign-produced oil, condensate, natural gas liquids and petroleum products destined for use in Canada. 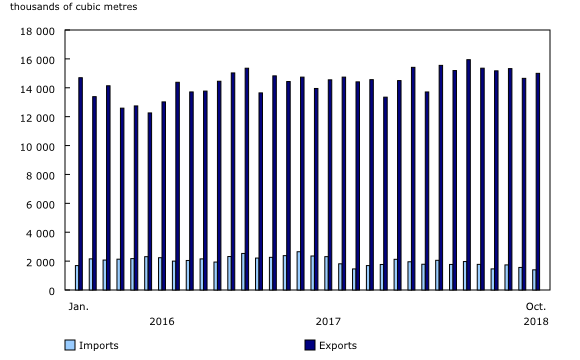 Exports include deliveries of Canadian-produced oil, condensate, natural gas liquids and petroleum products destined for use outside Canada. Deliveries to refineries include deliveries to upgrader/refinery complexes.